Oklahoma is now the most seismically active state in the country, recording more than 905 quakes greater than magnitude 3 in 2015. California had 535 such quakes in 2015. Magnitude 3 is the size at which most quakes can be felt at the surface. A magnitude 5.6 quake is nearly 400 times larger and 8,000 times stronger than a magnitude 3. The September 3 quake was felt from Illinois to Texas. In Nebraska, it was cited as the cause of an “unusual event” at the cooper Nuclear Station. One homeowner in Pawnee suffered minor injuries and three homes were damaged. Governor Mary Fallin declared a state of emergency. 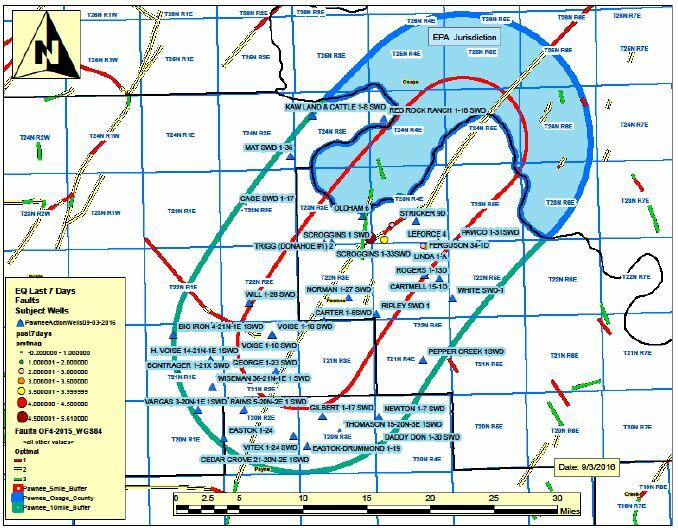 Pawnee County has not previously been the center of quake activity, but a large fault crosses through the county. Scientists have linked water injection from oil and gas operations to quakes in Oklahoma and Texas. Recently, EPA chided the Texas Railroad Commission for their reluctance to link quakes to disposal wells.